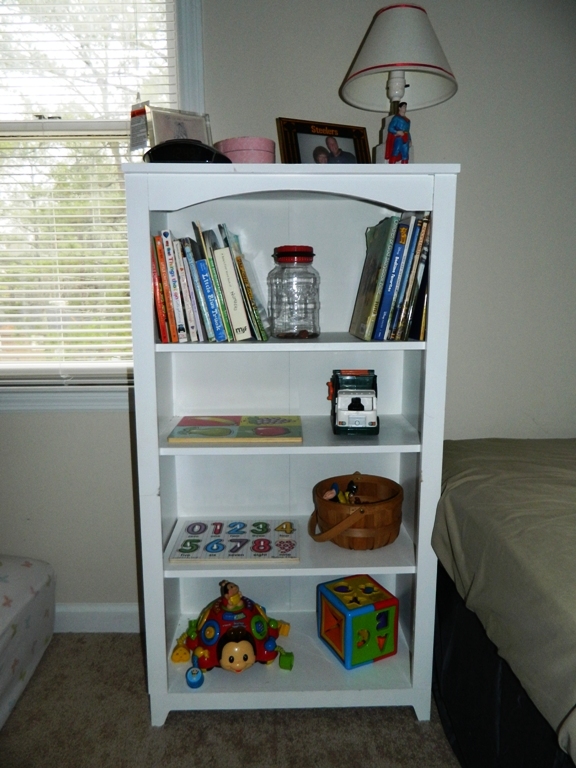 Part two of this series, I would like to focus on my children's room. 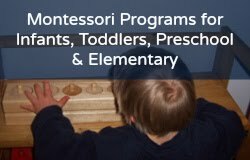 Creating a place that would be acceptable to the Montessori Method was a challenge for me. Everything I had ever known growing up as the oldest of four, or while babysitting through college, was that babies go in cribs. That is it. No way around it. After Samuel had his first night in the "big boy bed", I was sold that a crib was not what our family needed. 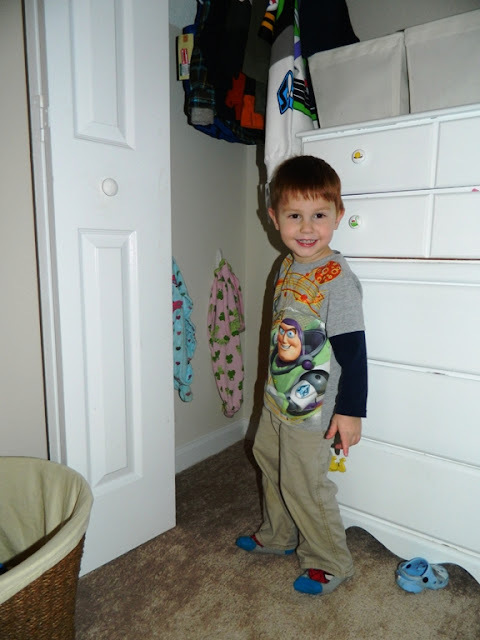 He was about 11 months old and fell in love with his new room. Our daughter has never slept in a crib. Not while traveling, visiting family, or under any other circumstances that requires her to sleep anywhere other than her own bed. A floor bed is just a part of life and we are all so happy with our choice. 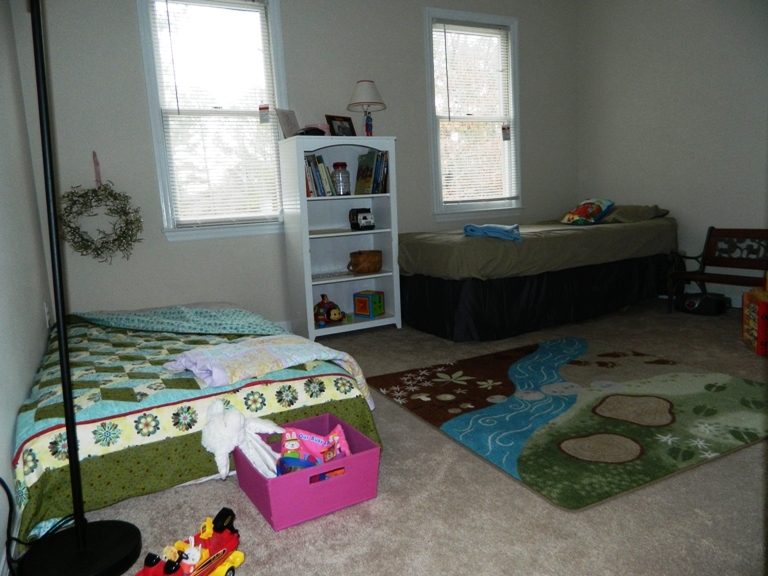 We chose to put the kids in the same room, even though we have enough rooms in our current house for them each to have their own rooms. This choice was primary so that I didn't have to create two child safe environments and I love the closets in this room! 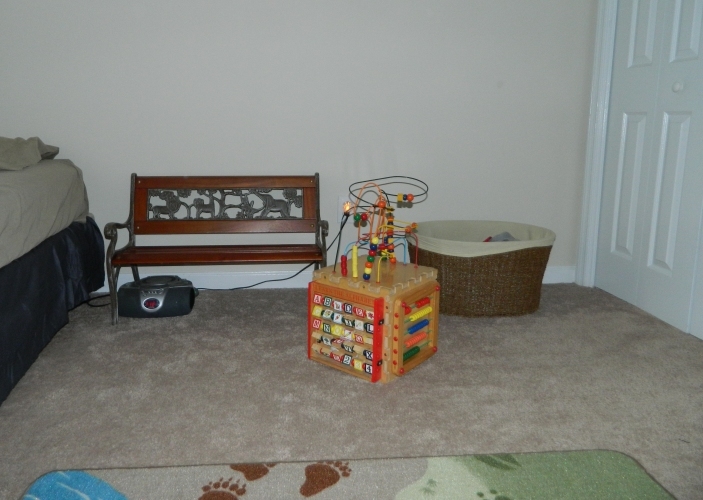 I found that the key to a Montessori room is to think of the whole room as a giant crib. If you wouldn't want your kids to play with anything or touch anything in the room without you there then it doesn't need to be in the room. Cover any outlets and conceal cords where you can. Most importantly spend time in the room with your kids and help them understand what is acceptable to play with and what is not. The carpet for this room is another IKEA find. It's a good thing I am on a budget or my whole house would be from IKEA! This is Avalyn's bed. It is very simply a twin mattress on the floor. The mattress was from a set of bunk beds which my in-laws used with my husband and his two brothers when they were young. Floor bed frames were pretty expensive when I was in the market for one so using this mattress seemed to be the next cheapest thing we could do. One less frame to move too! 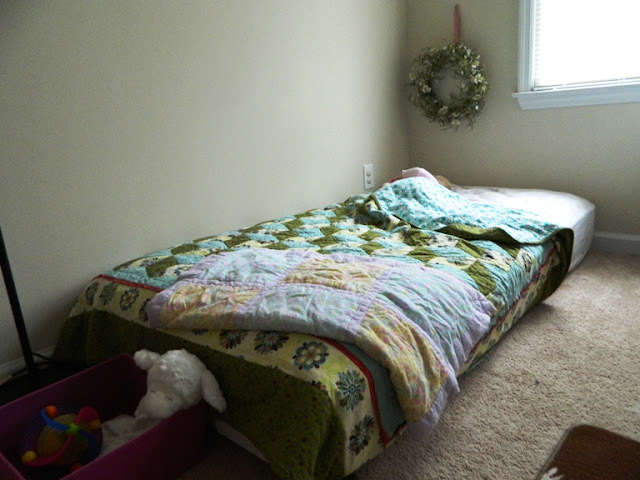 As an important note: the quilt has only been on Ava's bed for the last month or so. Before then we ONLY had a fitted sheet on her bed. PLEASE think of safety first when setting up your own children's rooms. 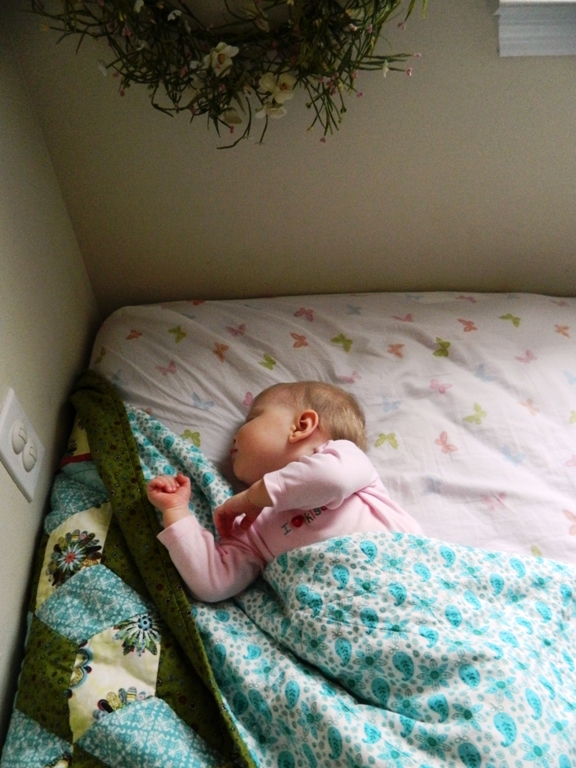 The wreath above Avalyn's bed is something I have worked on to ensure that she does not play with it. It is a personal choice I have made for that piece of art. Not that it is dangerous, but because it is pretty and baby hands can do a number on something like that. I never would have put it in the room if I felt VERY strongly about it not being messed with. As I have mentioned before we have amazing family and this bookshelf is just one of the million examples I could give you of that fact. This treasure was found by my mother-in-law on the side of the road as piece of trash! One person's trash is another person's treasure! She made sure all the boards were in tight and added a new coat of paint. VERY cheap and easy! 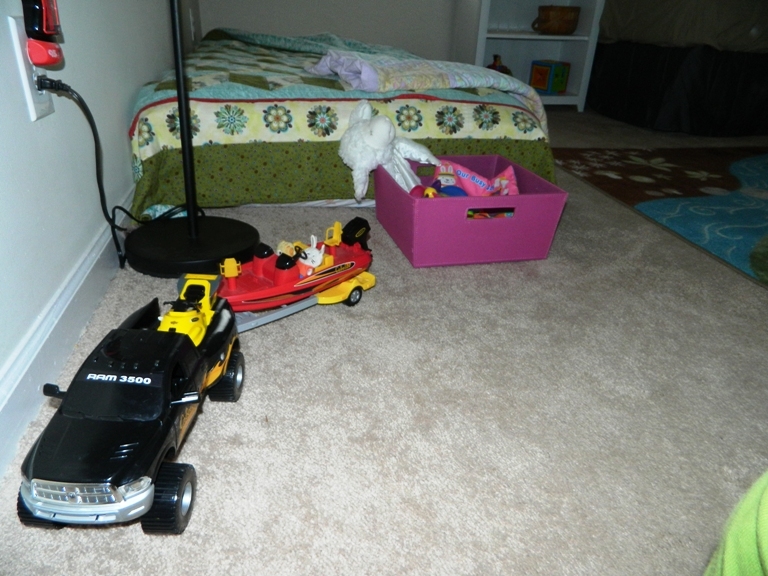 The toys that are in this room I consider quiet toys. They don't have any buttons that can go off in the middle of the night (or while one of the kids is playing and the other is sleeping. Yes, that can and does happen) and they can all be played with by either of the kids without supervision (so no small parts for Avalyn to choke on). Avalyn can stand now so she can easily get to the bottom two shelves. She often pulls down the numbers puzzle and crawls around with the basket. Samuel can get to the lamp if he stand on his bed, but when he inherited it this Christmas, we had a very important lesson on how and when it should be used. This is Samuel's bed. Your run of the mill twin bed on a frame. This bed also came from the same bunk bed set from my in-laws. Having his bed on a frame with a bed skirt gives him his own place. This is important since Ava isn't old enough to understand personal space without some guidance. 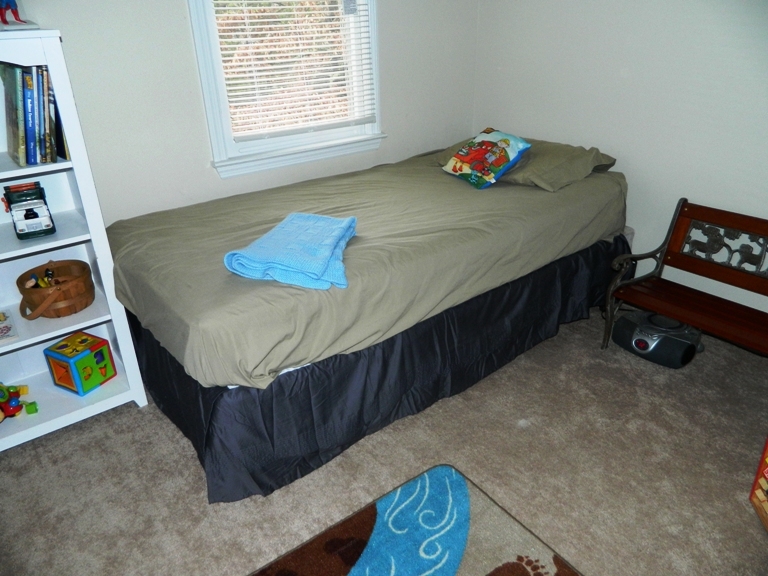 Sam is a naturally hot kid and can get overheated at night, hence the lack of blanket on his bed. This corner of the room is a space that Sam uses more often than Ava. He loves the CD player (which we only keep one calm/sleeping CD in) and the bench. The bench was a gift from my grandparents for Samuel's first birthday and it has found a permanent home is his room in every house since then. The wooden play cube I bought second hand from another military mom who was downsizing to live in a smaller home. The laundry basket is just that. Nothing special. It is the kids responsibility to put their own laundry in the basket. This is the left closet in the kids room. The dresser was bought by my in-laws in 1977 and has been used by about everyone in the family since then. Once again my awesome mother-in-law put a new coat of paint on it and found Pinterest ideas for hand painting cute pictures on all the knobs. 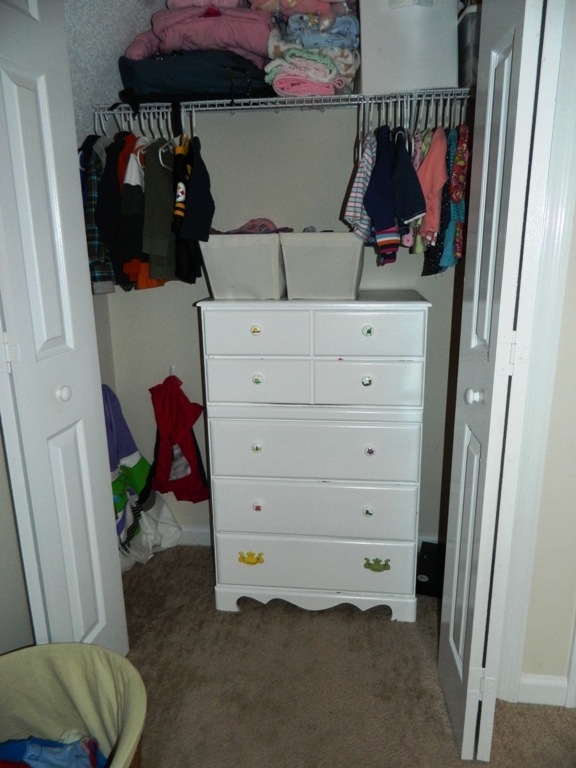 We chose to put the dresser in the closet to add a little more simplicity to the room while also eliminating any unforeseen potential hazards. Samuel's clothes are in the bottom two drawers and he can choose clothes he would like to wear. We added cheap hooks to the left of the dresser. See my amazon store for the kind I use. 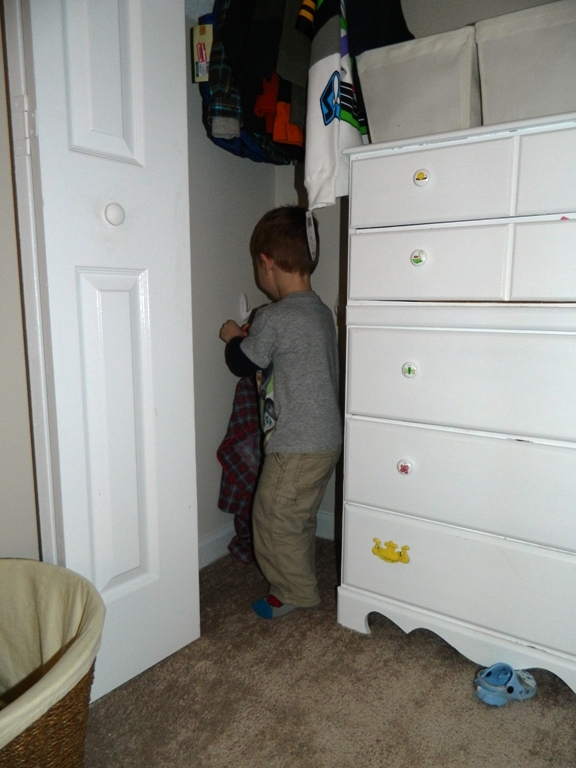 Samuel can open and close the doors by himself and can use these hooks as he sees fit. Usually there is a jacket and a robe on the hooks. Funny guy trying out some of Avalyn's clothes on the hooks. This is the right side of our closet. 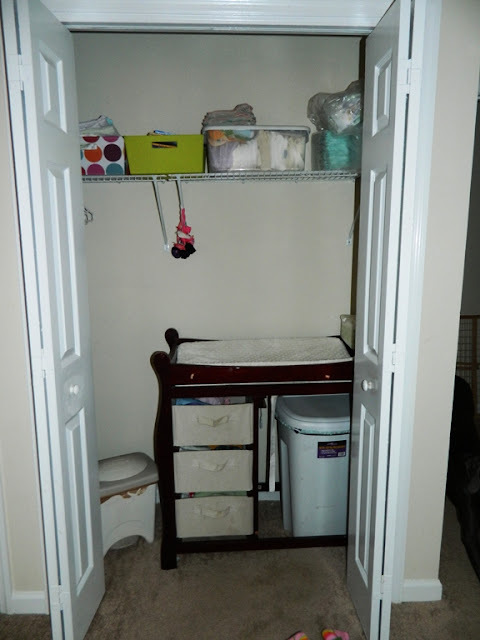 The baby changing table is also in the closet for the simplicity of the room and to eliminate any unforeseen possible hazards. The table was a baby shower gift when we were pregnant with Samuel. Our cloth diaper stash fits nicely in the drawers and our wet bag underneath. It has been very sturdy and I would recommend the design to anyone. We spend about 20% of our time in this room. Most of that time is before nap time when we read books and can wind down. Also, Avalyn often plays in here in the morning when she wakes up. She can play with the toys she chooses and we can lay in bed for a couple minutes longer while listening to her on the monitor. It is amazing what listening to a happy baby entertaining herself for a couple extra minutes can do for the start of your day! This is another very helpful blog post on setting up a baby's room that may give another perspective!